For the 2014 season, BREATH is being developed in two separate installments, with the first being presented in the Spring of 2014 and the second half by Summer. The Fall season will conclude with all eight new works being presented under one bill. The season’s dancers and choreographers for BREATH are Jessica Bryan, Jenna Faye Eugenides, Kaylee Goodwin, Jillian Ikeler, Jennifer Laucella, Alison Liney and Brianne Scott. Our BREATH is the bridge which connects our consciousness to nature and life itself. We are continually moving through air, much the same way a fish moves through water. By our breathing we are attuned to the world around us, sharing the air with nature and each other. Our BREATH expresses our inner feelings, our state of well-being, our excitement and even our anxieties. BREATH flows endlessly through all, sustaining us, and allowing us to express life’s nuances. Our BREATH delivers needed oxygen to the physical body, but it also brings energies needed to nourish our spirits. Allowing the breath of life to manifest fully through us and others, begins with sensing and observing ourselves in the present, paying special attention to the tensions that propel us through time, as well as the inner attitudes that fuel them. It allows us to be aware of “what is”. This consciousness is the beginning of real transformation, both for ourselves personally and for the world around us. It all begins with an awareness of BREATH. THREE is a collection of short stories, if you will, with dances that are no more than three minutes in length. The structure of the dance company is such that there is no single choreographer; rather each dancer is charged with setting work on their fellow company members. THREE poses the challenge of fulfilling a concise vision by creating a carefully orchestrated piece in a brief and fixed amount of time. A total of eighteen dance pieces were developed by the nine company members. The subjects of these pieces were as diverse as the company members, covering such themes as cycles of life, finding balance, mental health, selfless love, strength and even a personal journey to a most surreal world. Interactive, at times spontaneous, much of it personal and intimate: conversation comes between two or more people that affects something, someone, at some level. Dance allows us to express who we are within the context of the movement, and thus is the simplest form of communication. It is primal. It is a conversation in itself between body, breath and beat that can also be shared with others. Such conversations are indispensable; they are at our very core. 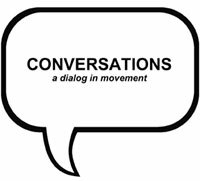 These conversations take on a life of their own, a dynamic momentum, with the ebb and flow of our daily lives. With this new work by MM2, each of the company members, dancers and choreographers, has created their own dialog through movement, their own conversation. From the very beginning when the first words were uttered, the ability to communicate has played an important role in our world. Whether within our own thoughts, spoken or written, words have the power to transform the world we live in. Love, laughter, heroism, friendship, and virtually every emotion we feel as human beings can be inspired by words. Unfortunately, fear, anger, and hatred, can also be invoked. Language is at its best when used to inspire others to find the best in themselves. Emergence is the way complex systems and patterns arise out of a multiplicity of relatively simple interactions. Emergent structures are patterns not created by a single event or rule. Nothing commands the system to form a pattern. Instead, the interaction of each part with its immediate surroundings causes a complex chain of processes leading to some order.There are numerous examples of emergence that can be found in nature. A flock of birds moving effortlessly as one or a school of fish moving together with such grace and coordination as though unified in a single thought. 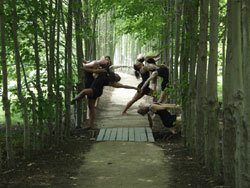 In exploring the movement dancers create, emergence can readily be identified. Each dancer seems innately aware of not only their own body as it moves through space but that of all the others in the group as well. And while most of the movement is orchestrated by underlying choreography and distinct counts, there does develop an emergence where the movement itself transcends this and takes on a life of its own.What develops are then highly complex and intricate patterns or emergence!